Each week, I'll be taking a closer look at the Patriots upcoming opponent, highlighting not only their personnel, but also strategical tendencies and how the Patriots might match up. This week Tom Brady makes his glorious return against the Cleveland Browns. Cleveland may be 0-4, but they've been competitive in every one of their games and have plenty of young talent. Here's a closer look at this weeks matchups. Through the first quarter of the season, the Browns have been a very good running team. Despite a thoroughly middle-of-the-pack attempts per game rate, they lead the league in rushing yards (597), yards per carry (5.7) and yards per game (149.2). 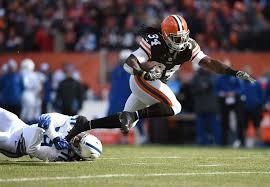 Much of the credit for that goes to Isaiah Crowell, who is taken a major step up so far in his third season. Crowell operates as the early-down, between the tackles pounder in a committee with Duke Johnson, and has yet to average under 5 yards a carry through the Browns first four games. For the season, Crowell’s 6.5 yards per carry average leads the league by a country mile, and he’s a close second to Ezekiel Elliot in both rushing yards (394) and yards per game (98.5), impressive feats for a player who has averaged just over 15 carries per game. A big (224 lb) back athletic enough to explode through the hole for big gains, Crowell has benefitted from the All Pro left side of the offensive line. Left tackle Joe Thomas is a grizzled 10 year veteran at this point, but the consistency of his excellent play is unprecedented at this point. Thomas has been named an All Pro in each of the past eight seasons and has yet to miss a single snap in his 10 year career. He’s flanked by Joel Bitonio, a high 2014 second round pick who has blossomed into one of the league’s best (and nastiest) left guards. The rest of the line consists of question marks. 2015 first rounder Cameron Erving was struggling at center before going down with a pulmonary contusion, and his replacement Austin Reiter suffered a torn ACL. That means that veteran John Greco, who has posted respectable ProFootballFocus grades at right guard this season, will be forced to switch positions to center. His likely replacement at right guard is Alvin Bailey, a castoff from Seattle’s godawful offensive line who looked woefully mismatched when forced into the starting lineup in Week 3. Right tackle has also been a problem spot, where Austin Pastor has surrendered 16 combined hits, hurries and sacks (the fifth highest total in the league amongst offensive tackles, per PFF) while also getting flagged for five penalties in four games. Injuries to Robert Griffin III and Josh McCown have opened the door for third round rookie Cody Kessler to start the past two games at quarterback. The USC product has been surprisingly competitive so far as a rookie, utilizing his poise and accuracy to complete 67.1% of his passes for a respectable 233.5 yards per game. Kessler has been an efficient dink-and-dunker, but his below average arm strength has preventing him from doing much more than that. His paltry 6.4 yards per completion is currently tied with the king of conservative passing, Alex Smith, and tops only Joe Flacco Jameis Winston and Blaine Gabbert. 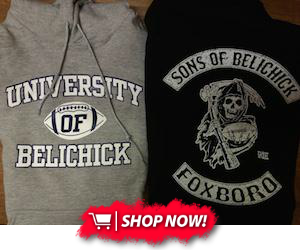 Against such a conservative passing game, expect the Pats to revert to the tight, press-man coverage that has been a defensive staple in Foxborough over the past two seasons. The Pats have the horses in their defensive backfield to win those matchups more often than not, and doing so will test Kessler’s ability to zip the ball into tight, contested windows. A month ago, it looked like a reinstated Josh Gordon would be joining electric first round rookie Corey Coleman and former quarterback Terrelle Pryor to form a tantalizingly talented young trio of receivers to match up with in this game. Now, Coleman is sidelined with a broken hand and Gordon is back in rehab, leaving just Pryor for the Patriots defense to key in on. As the Browns lone remaining playmaker on the outside, look for the Patriots to give him the DeAndre Hopkins treatment, giving him constant bracket coverage from Logan Ryan with safety help over the top to prevent the deep ball. Ryan’s physicality and ball skills gives him the best chance against the 6’4”, 223 pound Pryor, who excels both at winning contested catches and at creating yards after the catch. Ryan has earned a reputation as a reliable tackler at corner, and he’ll have to bring his A game against the explosive open field running ability Pryor brings to the table. He’ll also have to be aware of his usage, as the Browns will surely try to scheme ways to get him the ball in space. Much like fellow former quarterback Julian Edelman, Pryor will also get worked into the offense on gadget runs in addition to his steady diet of screens, hitches, slants and other quick developing routes. His throwing ability must also be noted, as he had a few completions on the run during the Browns near upset of Miami that recalled his time as a 14 game starter in Oakland. 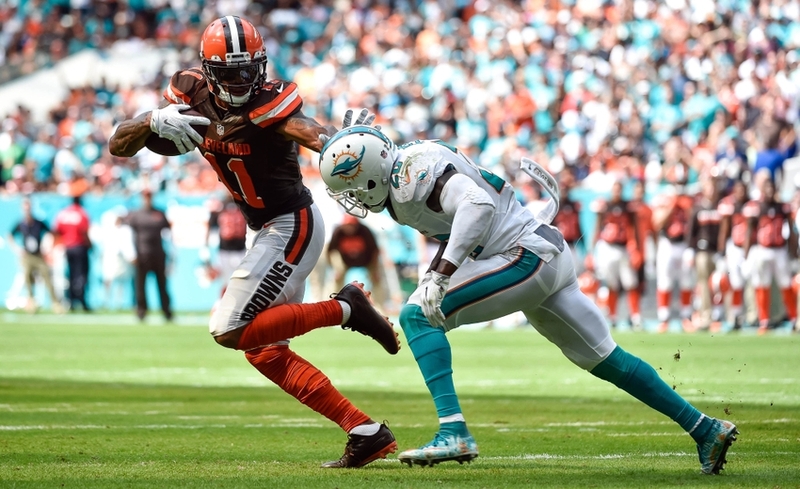 Pryor has flashed playmaking upside during the season’s first four weeks, but it’s easy to commit an extra defender to him given the Browns’ lack of complimentary weapons at receiver. Veteran Andrew Hawkins is a quick slot-type who will likely draw Malcolm Butler’s attention. Rookie Ricardo Louis has stepped into third receiver duties since Coleman’s injury, and his size (6’2”, 215) could be countered by Cyrus Jones. Jones leapfrogged Justin Coleman as the third corner in the Week 3 win over Houston, who featured the similarly big bodied Jaelen Strong as their third receiver. His solid tackling and physicality at the line make him a better matchup against Louis, who boasts an impressive size/speed combination and flashed run after the catch ability at Auburn. Coleman could be called upon when/if the Browns bring in rookie Rashard Higgins, who excelled thanks to slick route running at Colorado State. While the Browns lack proven receiver depth behind Pryor, they do have some dangerous complimentary weapons amongst the rest of the skill positions. 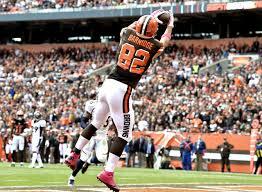 Veteran tight end Gary Barnidge hasn’t quite replicated last year’s breakthrough pass catching numbers, but he’s done enough to prove he’s amongst the better pass catchers in the league from the position. He’ll likely be tracked by Patrick Chung, who has had a quiet start to 2016. Another weapon to account for is Crowell’s committee partner, Duke Johnson. A third round pick from a year ago, the 5’9”, 210 pound Johnson has emerged as one of the league’s better third down backs. He’s a natural hands catcher and smooth route runner whose open field ability makes him a major home run threat once he gets the ball in space. To date, he owns the sixth highest receiving grade amongst running backs from PFF. The Patriots typically use Jamie Collins to match up against running backs in the passing game, and that could be the most concerning matchup in this one from a Patriots perspective. Collins has struggled at times in the past with smaller, quicker backs (see Darren Sproles last year) and Johnson’s explosiveness makes him a tough cover for even the most athletic linebackers. Johnson has been fumble=prone in his short career, something the Patriots surely have noted already. Against an offense that is limited partly by it’s personnel, the defensive game plan appears to be simple to me. Play base defense when Crowell is in the game and trust your talented front seven to win their battles and stop the run. When Cleveland does throw the ball (generally cued by Johnson’s presence in the backfield), pay extra attention to Pryor and trust your talented defensive backfield to win their matchups against far less accomplished receivers. The tighter the coverage, the better, as Kessler has yet to prove he can make you pay for crowding the line of scrimmage via the big play. The Patriots normally sound tackling will need to return after taking a week off against Buffalo, as the Bills short passing attack is extra reliant on it’s receivers creating yards after the catch. This also could be a week to dial up some disguised pressures and blitzes in an attempt to rattle the rookie quarterback and create some potentially game changing mistakes from him. The strength of Cleveland's defense so far has been the starting cornerback duo of Joe Haden and Jamar Taylor. Haden has rebounded from a down 2015 to rediscover his previous form as one of the league's premier shutdown corners. He's been flanked by Taylor, a Dolphins castoff who is finally capitalizing on the talent that made him a second round pick in 2013. The Browns don't rank highly in many defensive categories, but their five interceptions ranks fourth in the league. Haden and Taylor each have two picks to their name already. Unfortunately for the Browns, things get dicey the more you go down the depth chart. Third corner duties have been manned by veteran Tramon Williams, who has seen his play decline noticeably at age 33. However, the former Packers standout missed last week with a sprained AC joint and could very well miss this week as well. If he can't go, nickel duties will go to Briean Boddy-Calhoun, an undrafted rookie. Injuries muddle the picture at safety as well, where Ibraheim Campbell has missed the past two games with a hamstring injury. If the hammy keeps him out again, his strong safety role will be played by rookie thumper Derrick Kindred. Free safety is manned by Jordan Poyer, a 2013 seventh round pick of the Eagles. None of those three have impressed in coverage this season, although Poyer and Campbell have earned high marks for their run defense by PFF. In spite of the safeties best efforts, the Browns run defense has been thoroughly mediocre. They've allowed 4.3 yards per carry and 118 yards per game, both numbers which rank amongst the bottom third of the league. That's not particularly surprising when looking at the youth of this front seven, as the vast majority of the depth chart consists of players still on their rookie contracts. 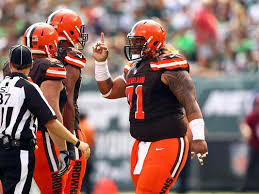 One such player is massive defensive tackle Danny Shelton. The 12th overall pick in last year's draft, Shelton struggled throughout his rookie year but has looked vastly improved so far in his second season. Listed at 6'2" and 335 pounds, Shelton is a massive presence whose size and power makes him nearly impossible to single block. He's precisely the kind of power player that has given the undersized interior of the Patriots offensive line (specifically David Andrews and Joe Thuney) trouble in the past. The Patriots will likely scheme their way around Shelton, either by running away from him or by targeting him with constant double teams. Veteran Stephen Paea has rotated with with third year man Jamie Meder opposite Shelton on early downs. Cutting back his snaps seems to have helped Paea, who has earned strong marks from PFF so far this year. Meder has been far less impressive, but still is outsnapping Paea on a weekly basis. The passing down role occupied by second year man Xavier Cooper has resulted in more snaps for him than either Meder or Paea. Cooper is a more of an undersized interior penetrator who relies on quickness to create disruption, but he has been particularly productive either. Things are just as green on the edge, where a rookie-heavy rotation has failed to impress early on. The leader of the rotation is Emmanuel Ogbah, a high second round pick who has flashed his considerable talent but has yet to produce consistently. Injuries have thinned things out behind him, as fellow rookies Carl Nassib and Nate Orchard are highly unlikely to play this week due to injuries. A fourth rookie, fourth round pick Joe Schobert, figures to get more snaps as a result, with four year veteran Corey Lemonier also likely to rotate in. At linebacker, the Browns have plenty of athleticism but lack the power to take on and defeat blocks with consistency. 2014 third round pick Christian Kirksey is more of a finesse backer, but he's excelled in coverage this year while using his considerable range to make plenty of tackles. The Pats will have to prioritize getting a hat on him in the running game, as he has the explosion to shoot gaps and blow up plays if unblocked. He's flanked by Jets castoff Demario Davis, who has been a liability so far this season. Much of the Patriots game plan will likely depend on how healthy their top passing game weapons are, as both Rob Gronkowski and Julian Edelman are a bit of a mystery health-wise right now. With Brady back under center, I'd certainly expect the Patriots to throw more than they have been, but continued commitment to the running game could be beneficial considering both the potential rust factor and some of the top weapons being banged up. With the Browns defense offering little resistance to opposing offenses this season, this could be a good game for the Patriots to attempt to re-establish their offensive identity with Brady under center. Simply put, the Browns special teams have been a disaster this season. This was highlighted, of course, by the team's week 3 overtime loss to the Browns, which stung particularly hard due to three missed field goals from newly signed placekicker Cody Parkey. They've been equally inept in the return game, averaging a paltry 6.6 yards per punt return and 16.7 yards per kick return as a team while allowing 13.4 and 29.2 yard averages to their opponents. As a result, their opponents have started their average drive at the 31 yard line, while Cleveland has started at the 25 on average. The lone bright spot has been punter Britton Colquitt, who has averaged 47.2 yards per punt, but even his performance hasn't prevented the Browns from suffering in the field position game.